Did you know that Whale Sharks are technically not a whale and not a shark? They are the ocean’s largest FISH. The area around Isla Mujeres, in the Mexican Caribbean, is blessed to be a migration stop for these beautiful, gentle giants for a few months every year. People travel from all over the world for the opportunity to see these magnificent creatures up close. Are you ready to check this off of your bucket list? Or are you looking for more information about what to expect? If you will be in the area from May 15th to September 15th, you do NOT want to miss this opportunity. It’s an amazing experience. Here is our guide for everything you need to know about this incredible, once in a lifetime adventure! Join us with our professional, fully licensed guides, who have over 10 years of experience! Whale sharks are the largest fish in the sea, with some measuring up to 40 feet in length. They have an average life span of 70 years and average weight of 20.6 tons. They filter-feed, swimming with their wide mouths open, passively collecting plankton and small fish near the surface of the water. Their favorite meal is plankton, and this is what allows us to see them up close and personal. They are slow moving, docile creatures and listed as “Vulnerable Species” hence the regulations set forth for these tours. Our convenient pick up/drop off point is right in Centro at Ballyhoo Restaurant on Isla Mujeres. It is located right behind the Pemex gas station on Rueda Medina (“the ferry street”) a few blocks North of the ferry terminal. The tour departs at 8:00 AM from Centro in Isla Mujeres. 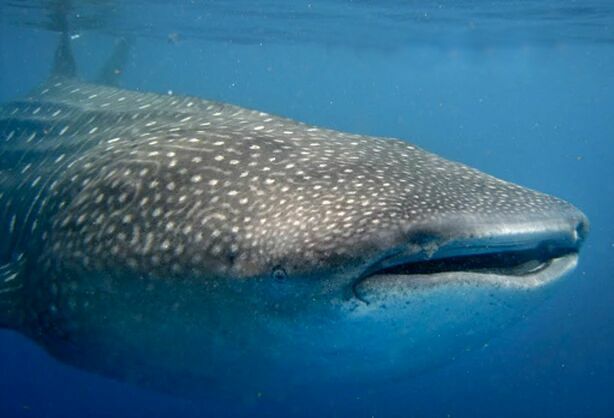 You can expect to travel about an hour by boat to reach the area where the whale sharks like to gather. 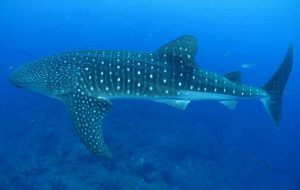 Once you have found the whale sharks, you will have the opportunity to snorkel (or just observe) with the whale sharks accompanied by a guide in the water. From this point, the captain will be looking for more whale sharks and move locations in order to find you the best spots for observation & more snorkeling. After seeing the whale sharks you will head to the famous Playa Norte to snorkel while your guide prepares a fresh ceviche on the boat. In select cases, you can skip Playa Norte and go on a reef snorkel instead. It would be either the Yunke reef by MIA hotel or the Che reef north by Contoy island (this will be your option if you are already in the area of Contoy. See below). 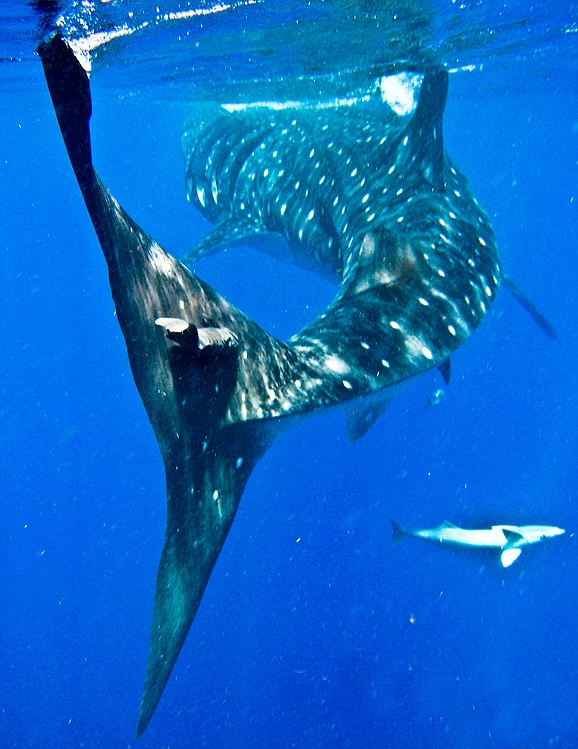 Since whale sharks are a protected species, tours are regulated to 10 people maximum per boat. We do not want to disturb their habitat with giant boats. Remember, this is their feeding ground, so, we need to respect their space and be as unobtrusive as we can. All of our boats can comfortably hold 10 people (plus your captain and tour guide). And all boats have a cover to provide shade. Scared of getting sea sick? See our PRO TIPS below. Your boat will be fully stocked with all snorkel equipment, life vests, bottled water/soda, and sandwiches (ham and cheese). At the conclusion of the tour, your guide will prepare you fresh ceviche on the boat while you snorkel at Playa Norte. Yes, it is required by law that all providers must have everyone on the boat wear a life jacket. You may opt out of wearing a life vest IF you bring a wet suit instead. Wet suits can also be rented for $10 USD but, you must let us know your size 24 hours before the tour departs so we can make sure we have your size available and ready. If you don’t swim well, the guide can snorkel with you and hold your hand. This is a hard question to answer. The season in 2018 is May 15 – Sept 18. 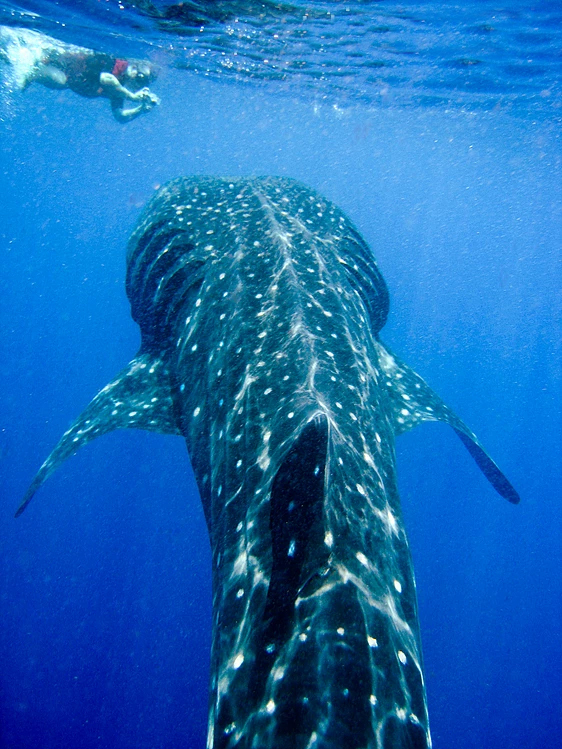 Historically the most whale sharks are here during July & August. 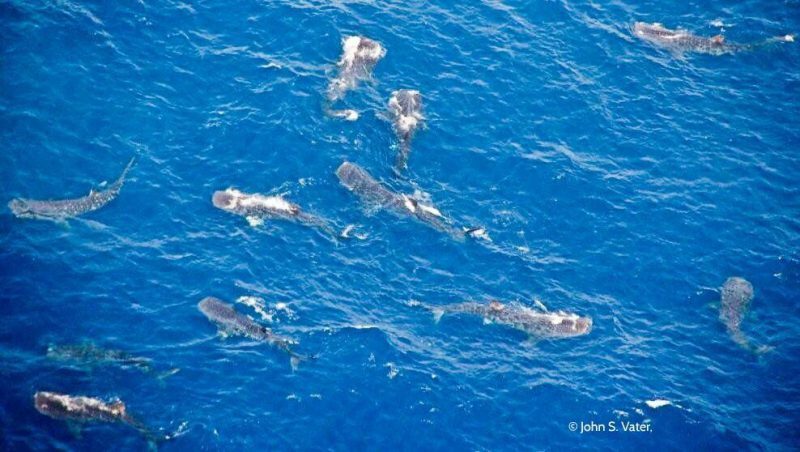 BUT, one of our first days this May, over 40 whale sharks were spotted! Our guide had some interesting advice. He said the BEST days for spotting lots of whale sharks are always when it is a full moon or close to a full moon. Why? Because fish tend to lay their eggs in plankton during full moons. And the whale sharks follow the food. Yes, our guides have a set day of rest on the following dates ONLY: May 30, June 30, July 30, August 30. Other than these 4 dates, the tour is available DAILY May 15th to September 15th 2018! Absolutely! You can arrange a private tour for 1-10 people. Please see below for pricing. A) Pricing for this tour is regulated by the government. It is $125 USD per person (which includes dock fee & reef tax). For our public tours, the minimum age is 10 years old. In our experience, smaller children are more prone to sea sickness & the effects of long hours in the sun. So, as a public tour, for the comfort of other passengers, we kindly ask that only children ages 10 and above come along. We absolutely have the option of booking a private tour for your family if you have younger children! See above. Tipping is always a tricky subject. It’s personal. Mexico is an incredibly tip heavy country. Salaries are based on the expectation of employees receiving tips. So, for those wondering what is a good way to tip: We recommend tipping as you would in a restaurant, about 20% of the price of the tour, or more based on service. You will have a Captain and 1 guide on your boat. They share all tips received. As always, tipping can be done in pesos or USD. All is deeply appreciated by the staff. CAN YOU GUARANTEE I WILL SEE WHALE SHARKS? We wish we could! One thing to remember is that these are wild creature in a vast body of water. Our guides have a great relationship with other providers and have communication with other whale shark captains so, they report to each other in real time when and where they have found whale sharks. They are not competing against each other. The goal is common amongst providers: Create the best experience possible for you. Keep in mind that the whale shark season also coincides with sea turtle mating season and there are also more schools of manta rays in the area. So, you have the ability to swim with sea turtles, manta rays and even pods of dolphins if you are lucky! Last year, we had 12 occasions where guests were able to swim with dolphins in the wild! This is totally fine. Some people are not comfortable getting in the water with these giant creatures. There is no price difference if you simply observe or snorkel. When it is windy and rains hard, the whale sharks dive deeper and the tour will be canceled if the conditions are too bad. You may reschedule for a later date. If your tour was canceled due to weather, and you are unable to re-schedule, your deposit will be refunded. See PRO TIPS below. Do NOT wait to book your tour for one of your LAST days here. Book it for your FIRST few days here. Since it is the rainy season, be aware that tours can be canceled for rain. If you wait until your last day or 2 and it rains, you will not leave yourself any room to re-schedule. If you are at ALL prone to sea sickness, take Dramamine or Sturgeon Forte (this can be purchased at local pharmacies) the NIGHT BEFORE your tour AND the MORNING OF your tour. The key is to not just take it right before you go. Don’t drink heavily the night before your tour & eat a balanced breakfast. 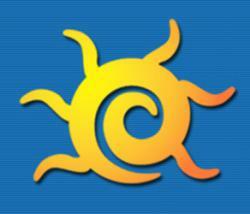 Bring BIODEGRADABLE sunscreen or purchase locally. (It is more expensive when you purchase locally.) Regular sunscreens create a film on the water that is not conducive to the whale shark’s feeding. It also damaging to the reefs and marine life. Rash Guard swim shirts are also recommended. The sun is very strong during these months and being on the water, it reflects even more onto you.